Ash-Lilly's Lacquer Lust: To gloss or not to gloss? That is the question. To gloss or not to gloss? That is the question. Revlon's 'Red Ribbon'. 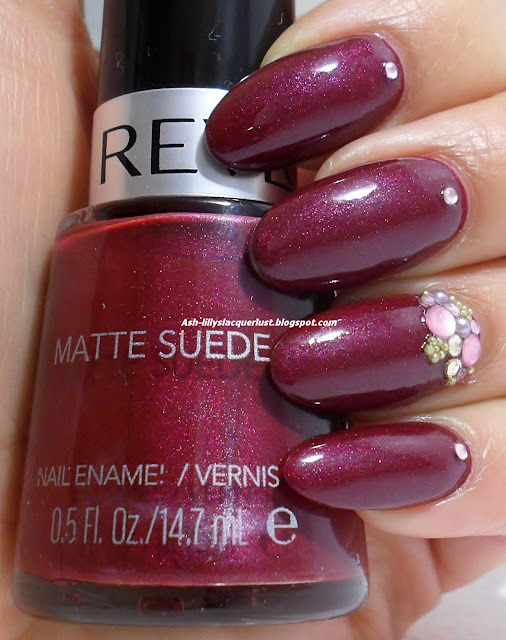 Yes, it's a matte polish and yes, it did look like suede...but when adhering the rhinestones, the polish became glossy in some areas. To fix it, I covered it with a glossy top coat. Admittedly, I do love glossy polishes. I'd rather turn a glossy finish into a matte by using a matte top coat, because that eliminates streaks (for me, anyway). This is what happens when you use cheap rhinestones! 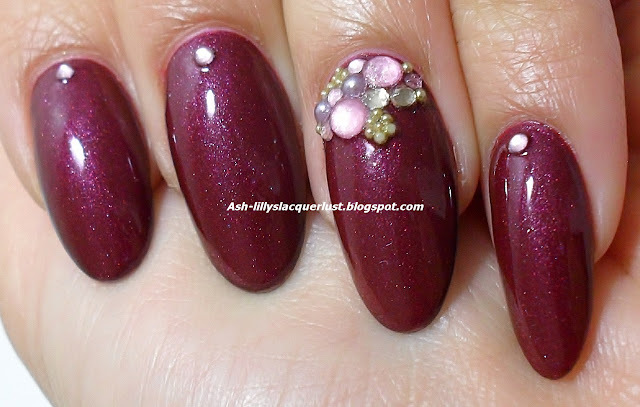 As soon as I embedded these rhinestones in the top coat, their backs started to wrinkle. Any integral shine they had diminished immediately. I ended up smothering them in top coat in the end. Now they don't even look like rhinestones! So, how do YOU feel about matte polishes? Are you a sucker for gloss, like me or is matte the way forward for you? Let me know in the comments box. I really like what happens to those matte suedes with topcoat. It shows up as a cool shimmer. Even with the wrinkling rhinestones this still turned out quite lovely! Thanks JQ - you're so right about the shimmer though. The gloss really brings it out. Thank you sweets. Sometimes you have to hunt, but more often than not, you can find some gems! This looks so beautiful Liane!! I'm like you, glossy is the way to go ;0). I agree with you. Black with a matte top coat is one of my faves! I don't think I've ever paid more than £1 for a Revlon polish. What would we do without Poundland?! I KNOW, hahahaha! Poundland rules and I feel perfectly comfortable rummaging around the hangers with a serious look on my face! What a beautiful polish and a bargain. I must go to my local poundland! Gloss! I have this one and it is stunning what shows when It's glossy!